The USA Pan 8 Piece Cookware Set is a set of 5-ply clad stainless steel cookware that includes a 7-inch 1.65 quart Sauce pan with Cover, a 4 Quart Stock Pot with Cover, an 8 quart Stock Pot with Cover, an 8-inch 1.9 Quart Chef skillet, and a 10-inch 3 quart chef skillet. This USA Pan 8 Piece Cookware Set provides home chefs with premium cookware that cooks your food the way it should -- rich with flavor and packed with nutrients. This is the perfect set for the master home chef looking to cook restaurant-quality food in a home kitchen. The aluminum core and technologically advanced metallic design for all 8 pieces allow for maximum heat transfer and even heat distribution. The craftsmanship of each individual item exemplifies the premium quality and high performance that has made USA Pan the predominant leader in the commercial baking industry. Each lid cover features a vapor seal design which seals in flavor and essential vitamins and nutrients in your sauces, broths, meats, and vegetables. Each USA Pan 5-ply stainless-steel cookware item in this 8 piece set undergoes an 18-step process that ensures excellence on every stove top. Each individual pan and cover is hand polished to a mirror shine, providing a stunningly vibrant appearance in the kitchen and on the table. Every item in this set is dishwasher safe, allowing for quick and easy clean-up. They are also oven safe, allowing for delicious crisp finishes to your favorite gourmet meals. For more than 50 years, USA Pan has provided professional-grade baking pans to leading bakeries. 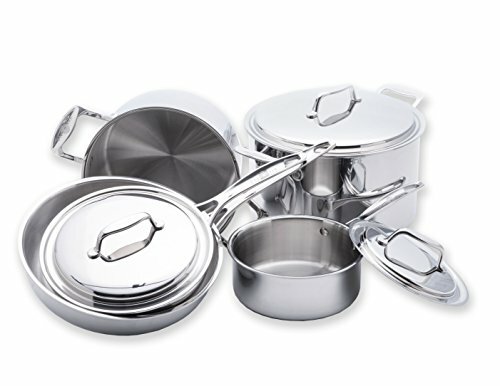 USA Pan cookware is made in America and is supplied with a limited lifetime warranty. USA Pan provides innovative and reliably durable cookware that deliver professional grade results to home kitchens. Set includes a 7-inch sauce pan with cover, a 4 quart stock pot with cover, an 8 quart stock pot with cover, an 8-inch chef skillet, and a 10-inch chef skillet.